I put peanut butter, banana, and honey in the blender, and my daughter asked what kind of smoothie I was making. None I said. I’m making muffins. What??? This goes down as the easiest and fastest batter I’ve ever made. Ready in about 17 seconds with the flip of a switch. I’m a big fan of whisk-together batters, and nearly every blondie, brownie, bar, quickbread, muffin, and cake on my site is made with a whisk. I reserve my stand mixer for cookie dough, bread dough, and frosting. But this batter is even easier than using a whisk. Just combine one egg, banana, peanut butter, honey, vanilla, and baking soda in a blender and blend, before stirring in chocolate chips. After a quick blend, here’s the batter. Did you notice what’s missing in the ingredients list? Flour. Gluten. 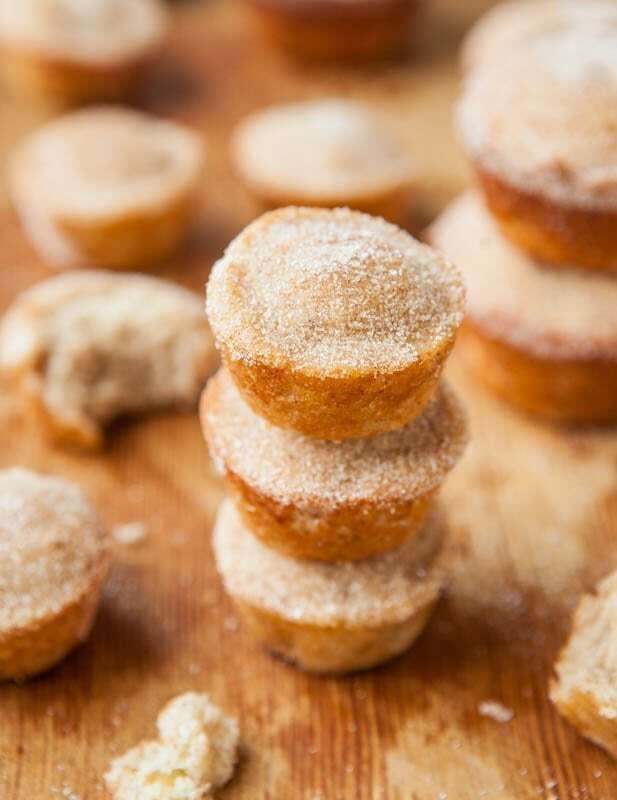 The muffins are gluten-free, grain-free, soy-free, dairy-free, oil-free, refined sugar-free, and they clock in at under 100 calories each based on SparkPeople’s calculator. 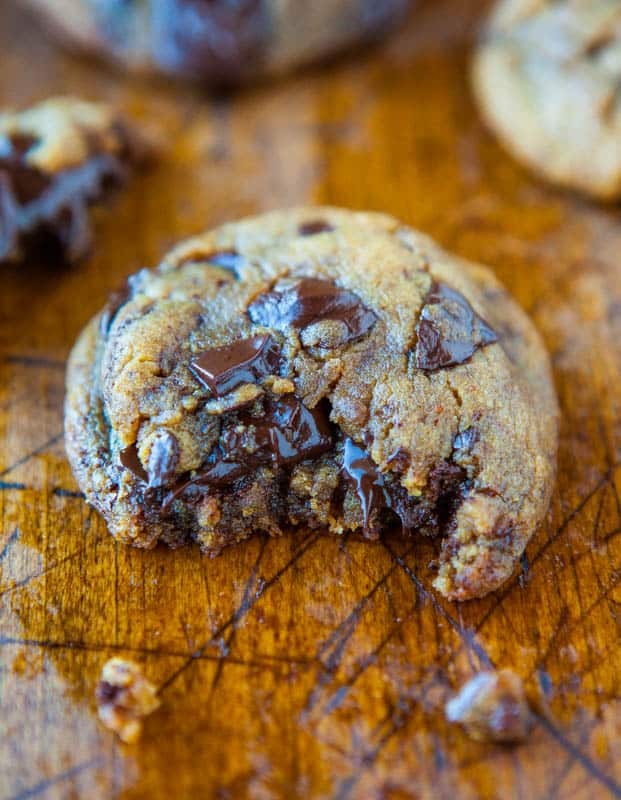 If you’re willing to give up the chocolate chips, you can shave off 35% of the calories. 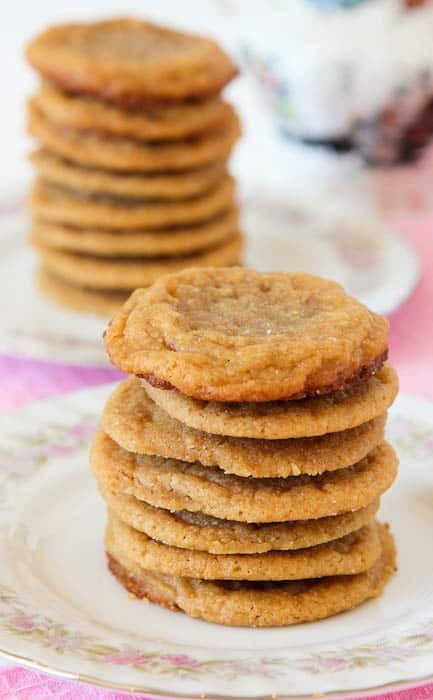 I have a few recipes for Flourless Peanut Butter Cookies, as well as other peanut butter cookies that are gluten-free or that don’t use white sugar, brown sugar, butter, salt, or oil. See the Related Recipes section below for many ideas. 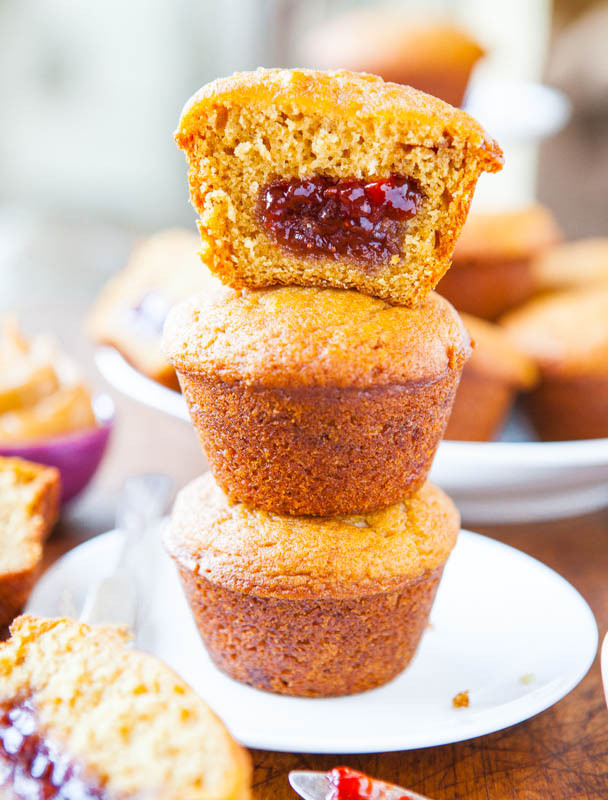 I had never tried to pull of a flourless muffin until now, and I’m sold because these are some of the softest, moistest, and best little peanut butter muffins I’ve ever had. 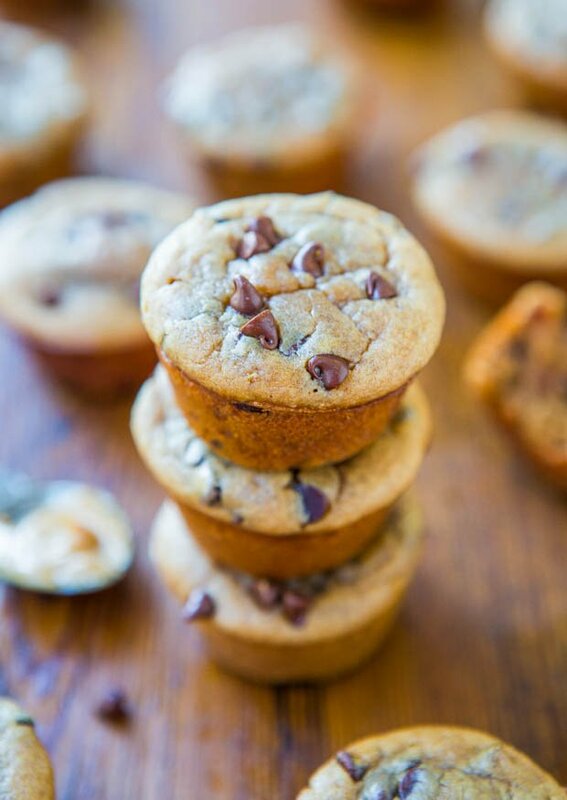 For all the health claims that can be made about the muffins, the best part is that they taste every bit as good as muffins made with flour, gluten, and lots of added sugar. Because there’s no flour, I was a bit worried that they may turn out like peanut butter fudge, since there was no flour to fluff them up and provide the normal amount of cakiness found in a muffin, but I was wrong. The egg, pinch of baking soda, and banana did the trick to give them the springiness and bounciness you want in a muffin. When I was stacking them, the muffins on the bottom were like little trampolines, ready to absorb the weight and bounced back. Bananas are versatile workhorses in baking, and the banana here helps to add lightness, fluffiness, and natural sweetness since there’s only 3 tablespoons honey used to sweeten the entire recipe. And for those who don’t like bananas, you’re very safe here and you can hardly taste it. My husband couldn’t taste it until I had him guess what was in the muffins. He answered, ‘peanut butter and chocolate’. Hello Captain Obvious. Only after I told him there was a banana included did he say, “Okay, I can barely taste it now”, paralleling my sentiments. My daughter did detect the banana, but I have a feeling that’s because she had a hawkeye on the ingredients as they went into the blender. 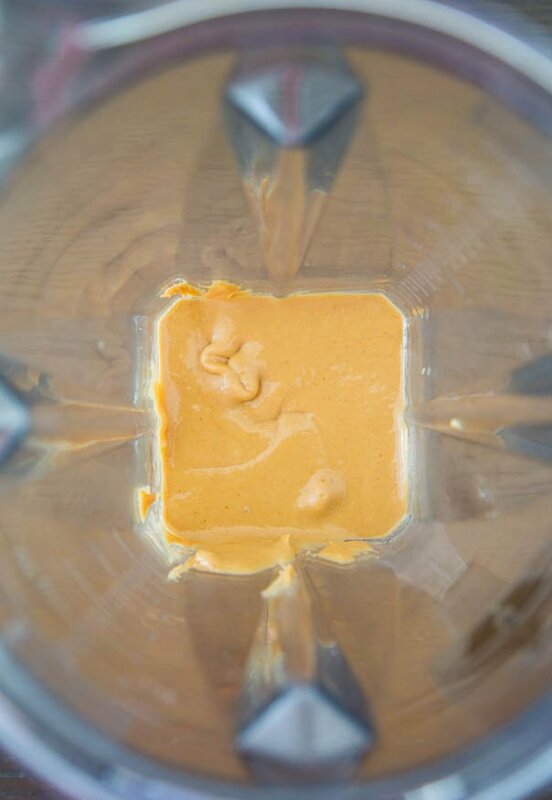 I used storebought peanut butter and always recommend baking with something like Jif or Skippy because natural and Homemade Peanut Butter tends to be thinner, runnier, and can separate. If you try natural PB, I don’t know what the results will be. The same can be said for almond butter. It’s much thinner and runnier than peanut butter, and I don’t know if it will work. I used mini chocolate chips because the size is perfectly proportionate for the mini muffins. Make sure to stir in the chips by hand at the end, rather than add them with other ingredients. You don’t want pulverized chips. One trick to make your muffins really shine is to sprinkle a few extra chips on the top of each muffin before baking for a nice visual pop. I baked the muffins in my mini muffin pans and they only took 8 1/2 minutes to bake. I made 17 mini muffins, and filled the cavities to a solid 3/4 full. Don’t be surprised if they’re nicely domed in the oven, but fall a bit as they cool. I haven’t tested the recipe as full size muffins. You’ll probably yield about 8 or 9 and I’d start watching the clock closely at about 13 minutes and go from there, but I haven’t tried, and am purely guessing. Part of the appeal of this recipe is the mini size. Mini food is just so pop-able. Just ask my husband who popped down 4 in 60 seconds. Warm and fresh from the oven, these little guys were incredibly good. 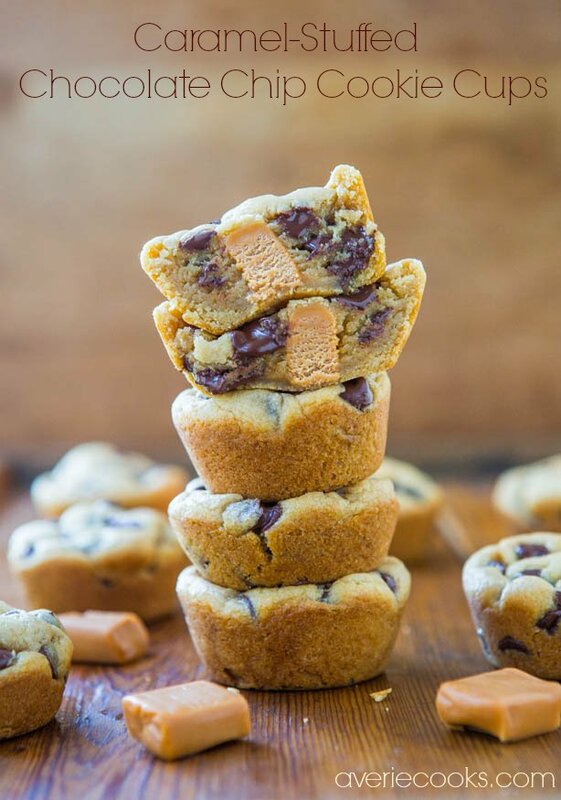 Soft and a little squishy, supremely moist, and tons of bold peanut butter flavor, complemented by melty chocolate chips. You may want to just double the recipe and make a double batch from the get go. Muffins freeze beautifully and you can keep a stash in the freezer to toss into lunches or for an easy snack when your peanut butter and chocolate cravings hit. At under 100 calories, have a few. 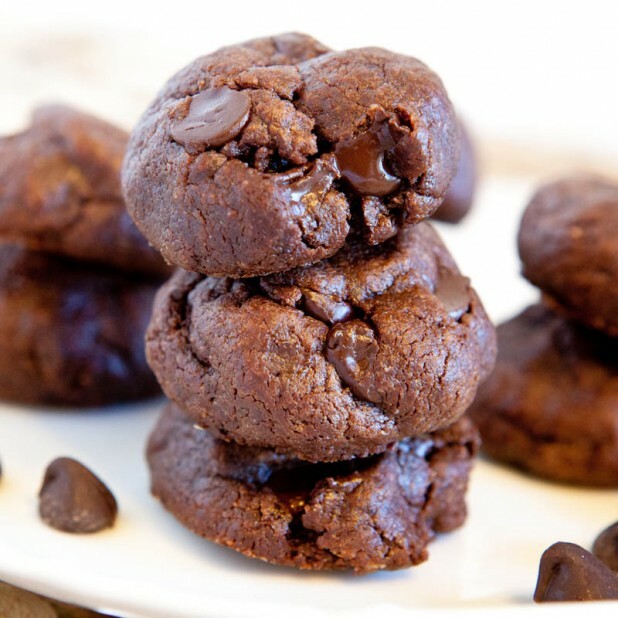 Also be sure to check out Flourless Double Chocolate Peanut Butter Mini Blender Muffins (GF) – No refined sugar, flour, oil & only 75 calories! They taste amazing! The fastest and easiest batter I’ve ever made. Combine all ingredients (except the chocolate chips) and blend until smooth. 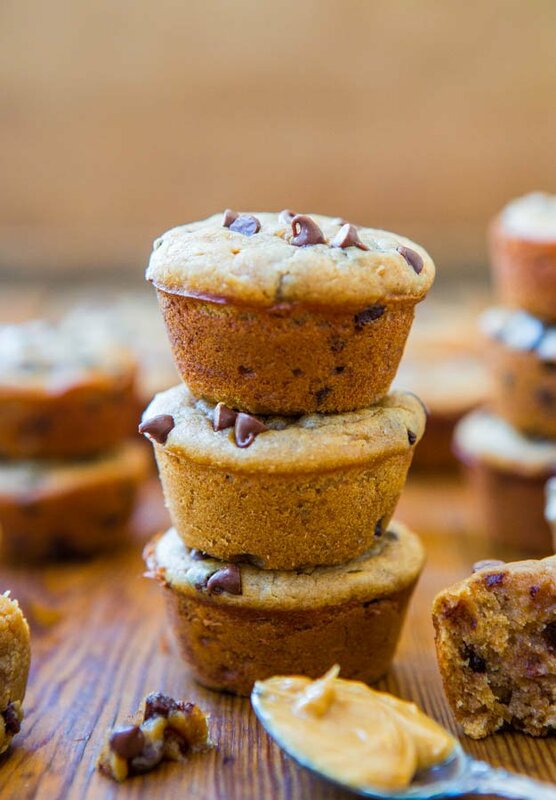 The muffins are gluten-free, grain-free, soy-free, dairy-free, oil-free, refined sugar-free, and they’re under 100 calories each (66 calories if you omit chocolate chips). 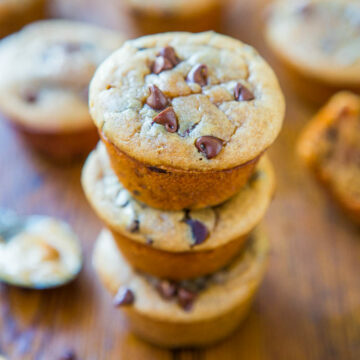 For all the health claims you could make about these muffins, the best part is that they taste every bit as good as muffins made with flour, gluten, and lots of added sugar. The peanut butter flavor is pronounced and bold, while the banana disappears almost entirely. I used mini chocolate chips because they’re size-appropriate for the mini muffins. To the canister of a blender, add first 7 ingredients, through optional salt, and blend on high speed until smoothy and creamy, about 1 minute. 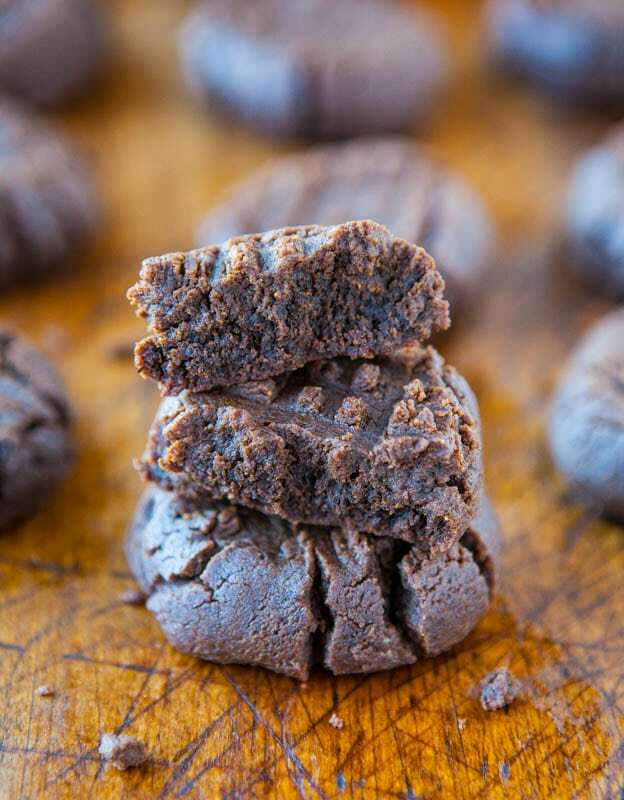 Using a tablespoon or small cookie scoop that’s been sprayed with cooking spray (helps batter slide off spoon or scoop easily), form rounded 1 tablespoon mounds and place mounds into prepared pans. Each cavity should be filled to a solid 3/4 full. Bake for 8 to 9 minutes, or until the tops are set, domed, springy to the touch, and a toothpick inserted into the center comes out clean, or with a few moist crumbs, but no batter. Due to their small size and oven variance, make sure to watch your muffins closely, and bake until done. 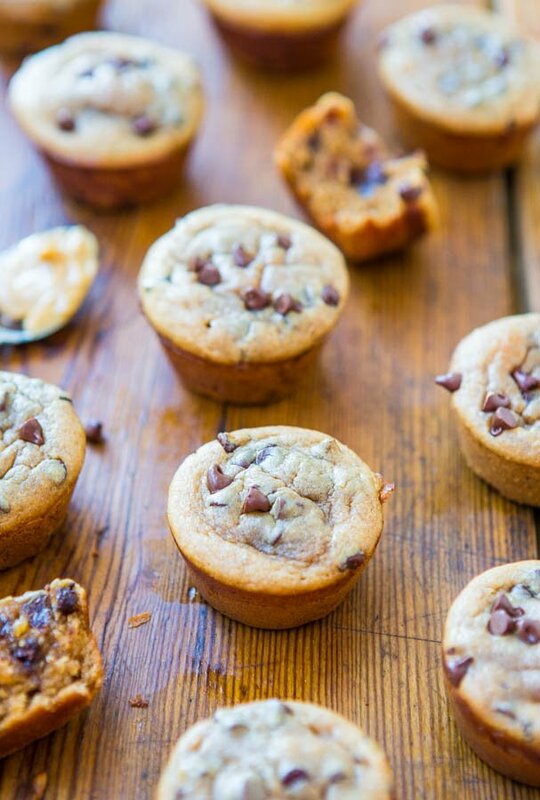 Allow muffins to cool in pans for about 10 minutes, or until they’ve firmed up and are cool enough to handle. Muffins are best fresh, but will keep airtight at room temperature for up to 5 days, or in the freezer for up to 4 months. 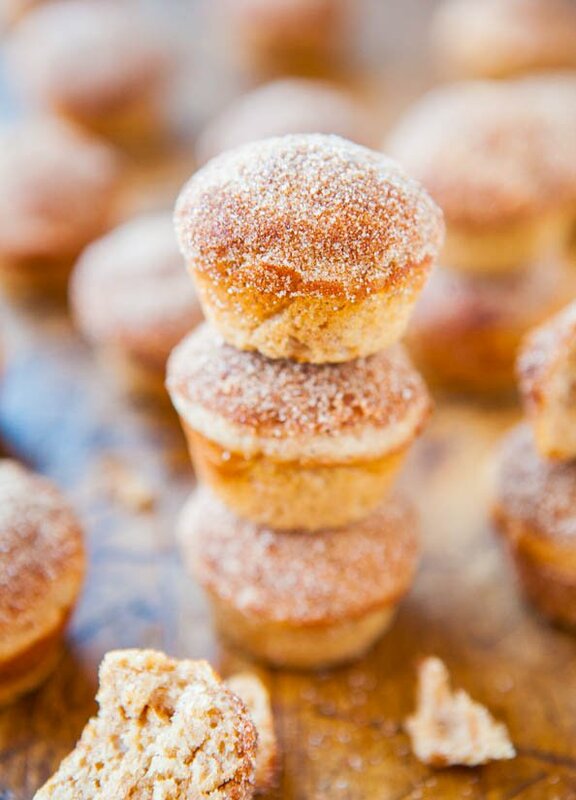 How many mini muffins is a serving for 100 calories? My batch made 24 mini muffins. They are delicious by the way! I definitely taste the banana over the peanut butter though, and I reallly can’t taste the peanut butter much at all but that’s okay with me! Thanks for the recipe! Exact calories are going to depend on exact size of muffins and yield per batch. I would use an online tool to help you calculate things exactly if that’s important to you. For me, about 1 muffin and about 100 calories is precise enough. I have been using this recipe for over a year now, but wanted to leave a comment and say how much I love it!!! It’s become a staple in our house. 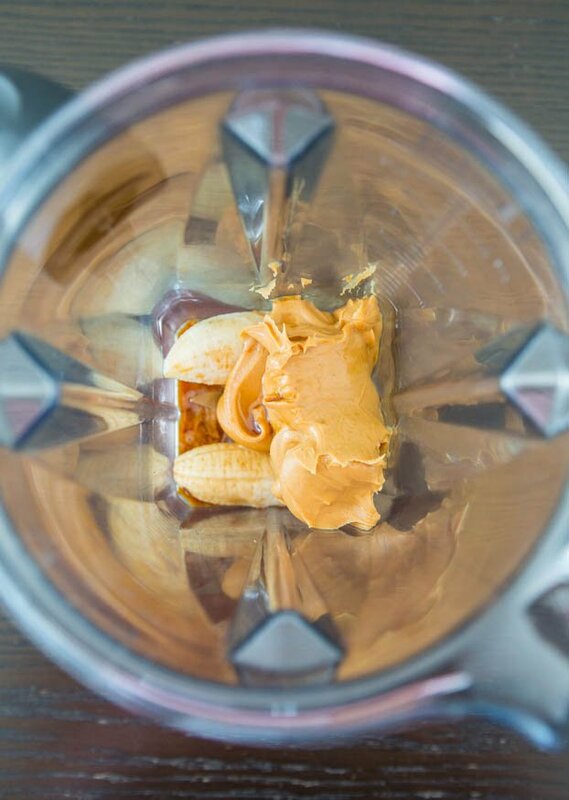 The recipe says you don’t recommend natural peanut butter, but I wanted to let you know that I use only Teddy brand natural peanut butter and they still come out great! :). Thanks for such a great recipe!! Thanks for the 5 star review and glad these are a staple! And glad to hear natural PB works great! I’ve made flourless muffins a few time now and every time they fall flat on top a few minutes after I take them out of the oven and I don’t know why??? Possibly underbaked by 1-2 minutes or check you baking soda – make sure it’s very fresh – and possibly add a pinch more next time since this has been a recurring problem for you. That should do the trick I am guessing. Thank you for this yummy recipe! I just made these and they are so delicious! I used Lilly’s Dark Chocolate Baking Chips. They are no sugar added chips and they are great. Thanks for the 5 star review and glad you enjoyed this! Could you replace the banana with something else? I never have so can’t say if it will work or with what to use. Looks absolutely delicious! I was wondering if you happen to know how many points these muffins are on the Weight Watchers Freestyle program? I started looking throug the comments to see if anyone else inquired but there are so many comments!! I just figured the WW points and as the recipe is written it is 4 per muffin. I’m wondering if you can use apple sauce instead of the banana? Have not tried it yet. But they sure look yummy. I’ve only made the recipe as written so can’t say for sure. Made using maple syrup instead of honey, peanut butter made with only peanuts, and cacao nibs. Delicious! Thanks for the 5 star review and glad you loved them with maple syrup, natural PB, and cacao nibs! Can I use a handheld electric mixer instead of a blender? It’s a pain to get the batter out. Also, do the muffins need refrigeration or would a ziplock or airtight container at room temp be ok if I’m not going to freeze them? Room temp is fine. I have only made these in a blender so can’t comment on a hand mixer, probably okay, but I have only made as written. I use an immersion blender stick and it is way less scraping out of the blender. I have found room temp leaves her muffins tasting better the next day than refrigerated. My muffins were a flop! They just fell apart and seemed undercooked no matter how long I baked them for. The batter was very liquid like.. could this be why? Too many chocolate chips? I don’t know what I did wrong but I want to fix it as these are so easy to make! Very liquid like…I would say your banana was either bigger than mine and/or very juicy, your egg was larger than a typical standard large egg. Your oven possibly wasn’t getting to temperature and I would check that too. “undercooked no matter how long I baked them for” seems like there is an oven issue going on too. Others have swapped with other nut butters successfully. I’d personally go with sunflower butter here. Hi Averie,These are simply delicious! I’ve made them three times in the past week or so. Amazing!! Thanks for the 5 star review and glad these hit the spot 3 times recently! 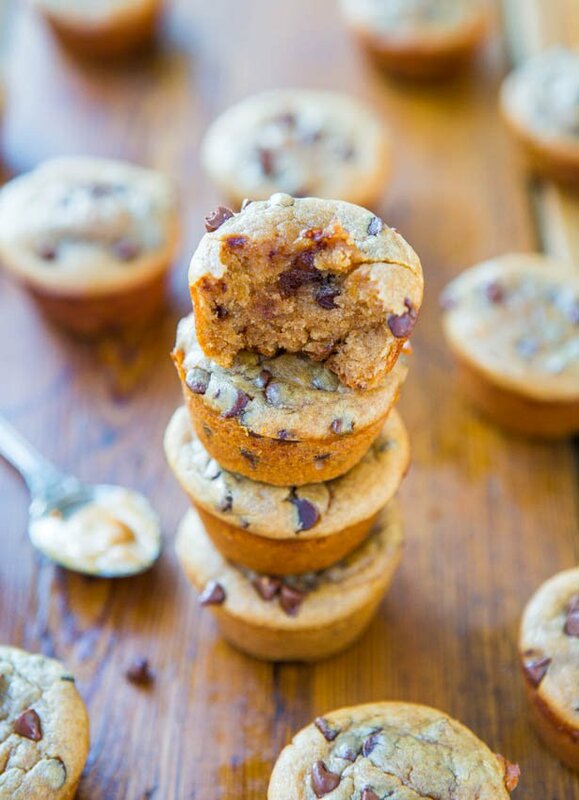 By far the quickest and easiest muffins to make. Prepared exactly as written and made 24 mini muffins. Everyone loved them and its great to have a healthier alternative. I can’t stop eating them! Thanks for the 5 star review and glad they are a hit! I just made these using sunbutter and they came out great! I am amazed at the consistency of the muffin being the they are flourless. My two sons gobbled them up! Thanks for the 5 star review and glad they came out great with sunbutter! I know, the consistency is amazing to me too considering they’re flourless! Love these. Blender is loud in the morning and we don’t like them as much left over. Curious about making batter ahead and refrigerating it. Afraid batter will be too thick. Other ideas?? I’m afraid they won’t rise – baking soda will be ineffective hours and hours later. Try it though once and see what happens. OMG, we love these! I made these, flash froze them and stored them in freezer bags in the freezer. On busy mornings these make a great breakfast side. I pop them into the toaster oven at 200f while I cook other food. A pat of butter melted in between a sliced muffin is so enticing. I’m going to do a similar thing with the double chocolate mini muffin recipe, it’ll be a lunchbox treat that I can defrost the night before. I have 3 kids between the ages of 2-5 years. the 5 year old has some significant health issues. A recipe like this that packs in so much good stuff but is also tasty, easy to prepare, and freezable is the holy grail of food blog posts, imho.PS. I used natural organic peanut butter, I didn’t do a heaping 1/2 cup, just a plain 1/2 cup. It worked perfectly. I spent a few minutes thoroughly mixing my PB before I measured to ensure it would not be to oily, and I think it’s important if you’re using nut butter prone to separation. Thanks for the five star review and glad this is a holy grail recipe for you on all the levels you mentioned! 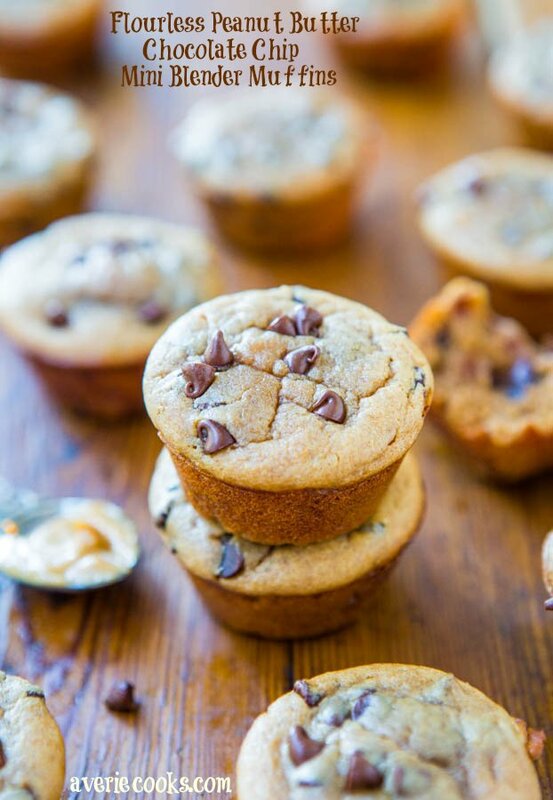 Can you use muffin papers instead of greasing and flouring the muffin cups? Yes I suppose but I never have. Thanks for the five star review and I’m so glad that these worked out even with your friend’s allergies! I made this in hopes of baking more flourless recipes and offering more nutritious desserts to our 3 growing children.The prep and bake time was simple. They baked evenly and browned beautifully. The taste test revealed a banana flavor paired with barely a peanut butter taste. We will see how the kiddos like it. These turned out delicious!! My two boys loved them for snack time today and I enjoyed them for breakfast. Thanks for the five star review and I’m glad that they turned out delicious and your boys loved them! I shared this post on Facebook too. You can make them as full size muffins. 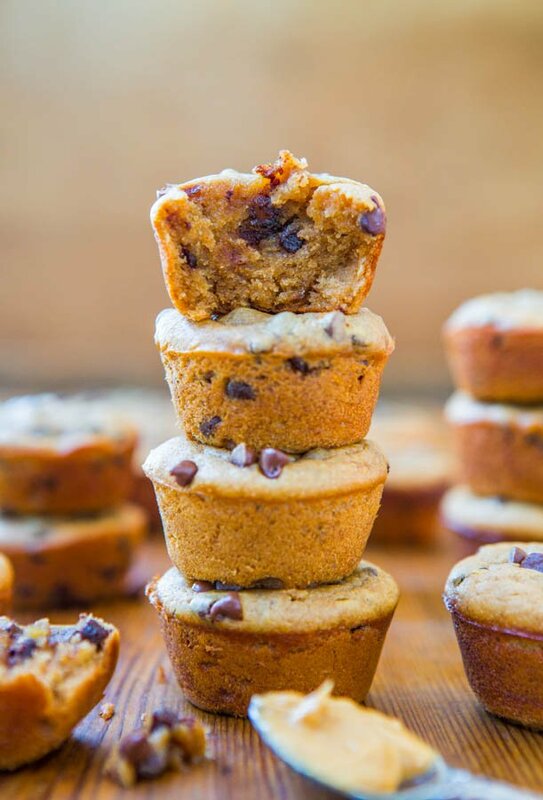 muffin pan and cook them 10 minutes at 400. These are the best things ever! I’m on the autoimmune Paleo diet, so I can’t have peanuts. 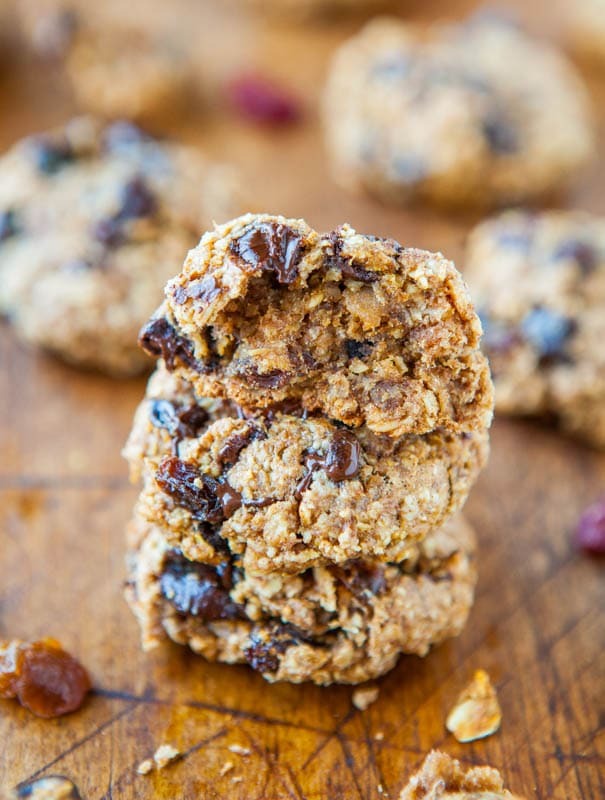 I use almond butter, the natural kind where you have to stir, and these come out great. I make them regular sized and they take about 10 minutes in a dark pan. I eat these before my runs and they give me what I need to make it through. 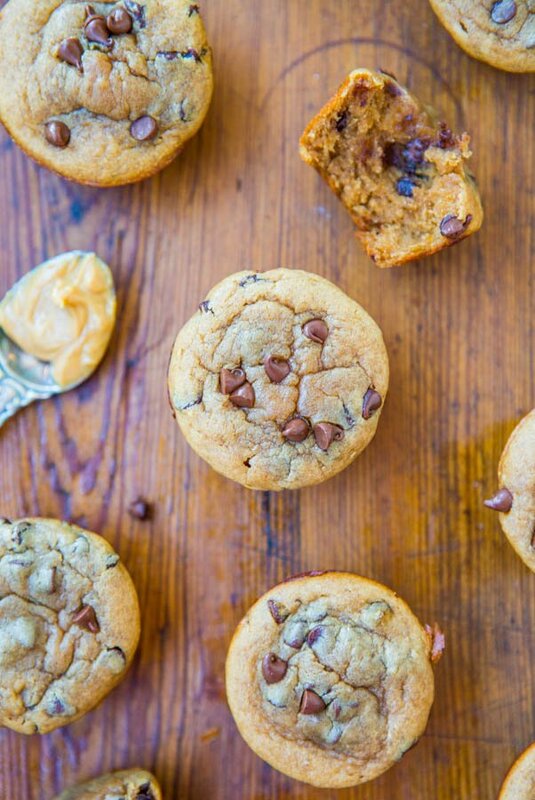 I ate them before my marathon and I now call them my magic marathon muffins. Seriously, thanks for this recipe. They are a staple at my house. Thanks for the 5 star review and glad these turned out great for you with natural almond butter! This is one of my favorite recipes!!! I have made it so many times over the past few years. I always use natural peanut butter and always double the recipe :)I tried a new modification tonight for my son with food allergies. Substituted almond butter. For a double recipe, instead of 2 eggs, used 2 egg yolks and 1 chia egg (1 T chia seeds and 3 T water). If the eggs bother him, I think I could just use chia eggs next time. He LOVED them. These are delicious– thank you!!! Thanks for the 5 star review and I’m glad you love this recipe so much and have found a way to make it work for your son! I make these muffins every week. I use less peanut butter and they turn out fine. 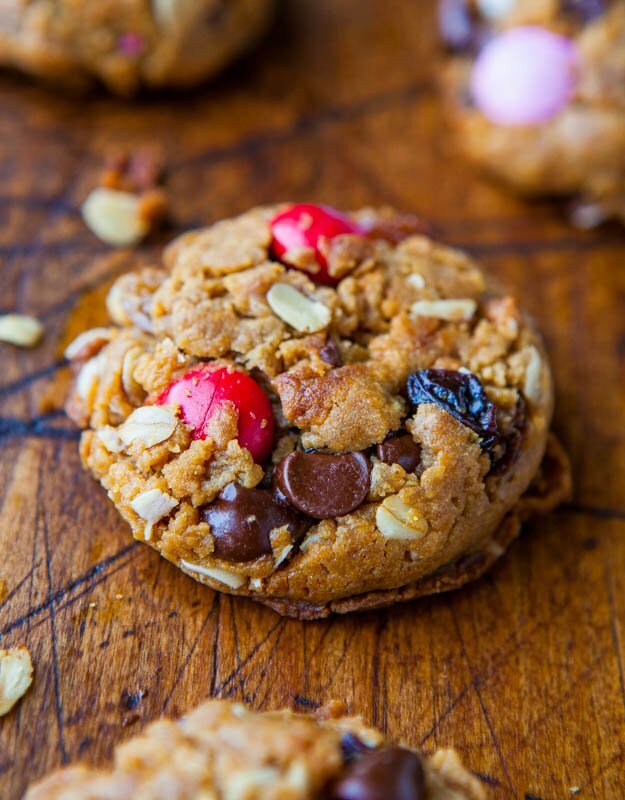 I sweeten with maple syrup and add carb powder as I don’t need the sugar in choc chips. I added an extra ege this last time and they were more cake like. My next experimentation is going to be to make a cake in a 1.5″ round pan and leave out the carob powder and make a berry sauce to have with it. Love your recipes!!! 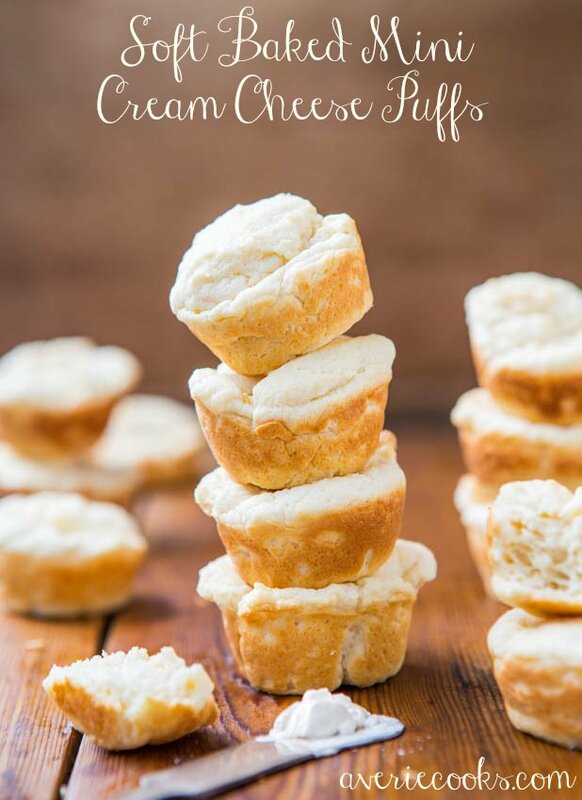 Glad these are a weekly favorite for you and that you have been enjoying experimenting different variations, too! Hi Averie, love, Love, LOVE this recipe! Do you know how long would I cook this if I made it in a loaf/bread pan? I really don’t, but with baking the best way to learn something is just by giving it a try. Enjoy your love!